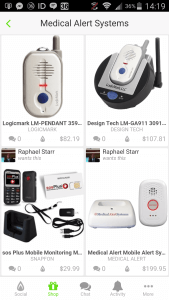 You are here: Home » Reviews » Medical Alert Systems » Medical Guardian Review–What’s Not to Love? It’s been a while since I reviewed medical alert systems. I did a review of Lifestation and Bay Alarm Medical on this review. Today, as I continue to hear reports of people close to me falling and injuring themselves, I wanted to do a little more digging. I came across Medical Guardian and was pretty impressed. I went to their website and saw a huge picture of Florence Henderson–their spokesperson. I reviewed the others based on initial call, format, range, battery life, monitoring, add-ons, contract, what sets them apart, and price. I want to remain fair and do the same for Medical Guardian. Why do I start with the initial call? Well, if you need anything from a medical alert system, it’s communication! Without communication, you just own a piece of jewelry instead of an alert system. When seconds matter, you don’t want that! The more I do this format section, the more I want to just get rid of it since most of these providers are so similar! You get a base that either uses a landline or cellular (At&t for Medical Guardian) and a pendant that is waterproof that you can wear in a wristband or neck pendant. This seems to be pretty standard in any provider of medical alert systems. However, from there things do tend to be different, which is why I keep using this heading. Medical Guardian also offers two more options. One is a mobile GPS unit that you can use at home or on the go (with a mobile very portable base). And the other is an upgraded “Premium Guardian” that is spruced up with 3 times the battery life and automatic fall detection. On their page, they boast that this device is the “Most advanced technology in the field.” I believe them! There is no base required for this one. The maximum distance between the alert pendant or wristband and the base is what we look at for range. A lot of people may think that these are designed to be contained inside an average home. They may think that if you took a step outside or went to a neighbor’s house, that it wouldn’t work. Well, the range of Medical Guardian alert systems can surprise you. 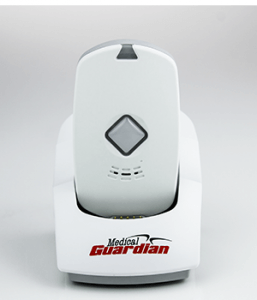 The shortest range on any device that Medical Guardian offers is 350 feet. That’s a football field! This is the mobile unit with the base (called Mobile Guardian). The home guardian that runs off of cellular has a 600-foot range and the landline unit has a 1300 foot range. THIRTEEN HUNDRED! I was impressed by Bay Alarm Medical’s 1000 foot range, but this takes another football field further (almost). This is the furthest I’ve seen (of course, this doesn’t include their Premium Guardian that has an unlimited range. All in all, you can find a unit that has any appropriate rage for you. With Medical Guardian, all your equipment is taken care of, including the battery. That being said, there are some battery life expectations you should have when looking into these systems. The two plugged-in units have battery backups (which is standard for these types of devices). The battery backup life is 32-36 hours depending on which base you get. When it comes to the mobile units, the Mobile Guardian has 24 hours of battery life. The Premium Guardian that requires no base has a 36-hour battery life. It comes with a holster even, so it’s meant to be with you for a while at a time without being charged. What is monitoring? This is what you pay for in addition to the technology. There is a UL certified call center where people wait to get a signal from your alert button. Once they receive that signal, they then dispatch the appropriate family, friends, neighbors, OR emergency personnel that’s needed (depending on what you need). If you have a GPS-enabled device, the monitoring center also is able to pinpoint which authorities to contact for you. UL Certification is key if you want proper, professional response. You can get the basic systems if you want. The basic systems come with one base and one pendant. However, you can get other things as well, if it fits your situation. You won’t have to pay up-front for these add-ons, but they will cost extra per month/quarter/year. On the land-line system, Classic Guardian, you can get extra pendants for $2.00 more per month each, and/or up to four wall-mounted buttons for $2.00 per month more each. You also get a free lock box add-on if you desire. The Home Guardian (mobile connection base) offers the same free lock box. In addition, you can get up to four additional pendants for $2.00 per month each. But instead of wall-mounted buttons, you can get fall detection added for $10.00/month. Fall detection is coming to be very popular among people shopping for medical alert systems. For their third model, the Mobile Guardian, the only add-ons available are the extra pendants and lock box. I think that for the price, it would be smart to go with the Premium Guardian that offers fall detection as standard (rather than $10/month on the Home Guardian). However, you only get one pendant there, and there’s no add-on for additional. You do still get the free lock box if you so desire (which is a great deal!). I like the story of Medical Guardian. Geoff Gross, the CEO, actually started the company out of his apartment after his grandmother suffered from multiple falls. He made his first sales on his own, 2500 of them! The were the 2014 winner for #1 choice overall in the Medical Alert Systems by the Best. 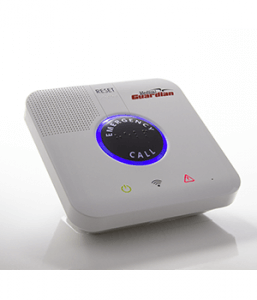 The Premium Guardian is really cutting edge technology if you are looking for something that is taking medical alert systems to a new level. I’ll make this simple. There is no charge for the equipment or installation. The base price is easy too, easily around the industry average. Classic Guardian is an affordable $29.95 per month. You do get a discount if you go with the annual plan (which works out to be $27.45 per month). Home Guardian is not much more at $34.95 ($44.95 with fall detection) per month (or $32.04 per month for annual). Next step up, the Mobile Guardian is the $39.95 per month and the last is $49.95 per month (both with annual discounts). These prices aren’t bad for what you get, actually. Of course you can put no price on the life that it will save. There is no long-term contract. It is month to month if you pay monthly, year to y ear if you pay annually, ect. This is a great company with a great product, great story, and great monitoring. I don’t think you can go wrong with them. They have a product for every budget and every range requirement. As far as monitored medical alert devices, this a great buy. I hope this helps you! It can prove to be valuable for yourself or someone you love. Please leave comments below! Also if you prefer, you can find non-monitored devices at Best Buy or on IT. What is IT? Look at my review. These are some examples. Thanks for reading!